Reporter Katy Tur Shares Her 'Front-Row' View Of The Trump Campaign Tur was at a rally in South Carolina when Trump called her name and pointed at her from the podium. Then, she says, "The entire place turns and they roar as one ... like a giant, unchained animal." 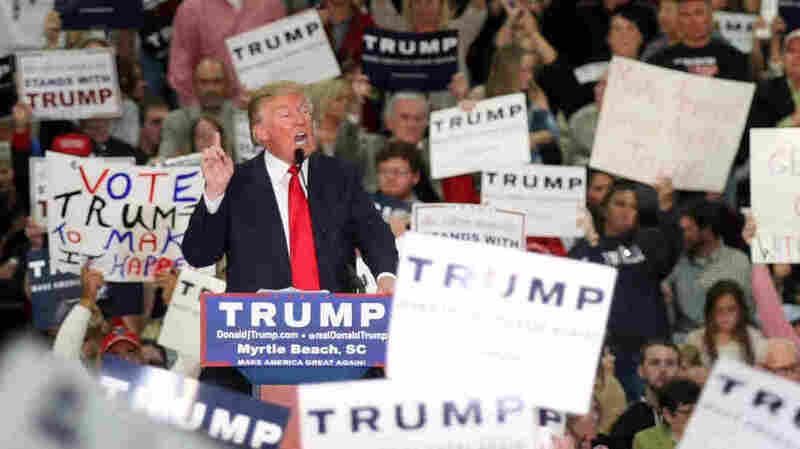 Then-Republican presidential candidate Donald Trump speaks during a campaign event at the Myrtle Beach Convention Center, in Myrtle Beach, S.C., on Nov. 24, 2015. During Donald Trump's campaign for president, there were times at his rallies when he singled out one reporter for criticism. Katy Tur, who covered the Trump campaign for NBC News and MSNBC, remembers those instances vividly. Tur was working at a rally on Dec. 7, 2015, in Mount Pleasant, S.C., when suddenly Trump called her name and pointed at her from the podium: "'Katy Tur, she's back there. Little Katy ... what a lie it was ... what a lie she told,'" she recalls him saying. Then, Tur says, "The entire place turns and they roar as one ... like a giant, unchained animal." Men stood on chairs to yell at her, and she began to fear for her safety. She smiled and waved in an effort to defuse the situation. Later, the Secret Service escorted her to her car. As the first network news reporter assigned to the Trump campaign full time, Tur became accustomed to jeers and threats from Trump supporters. 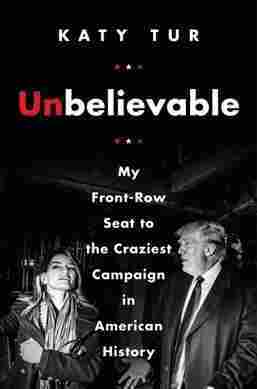 Now she has written a memoir about her experiences on the campaign trail, called Unbelievable: My Front-Row Seat to the Craziest Campaign in American History. 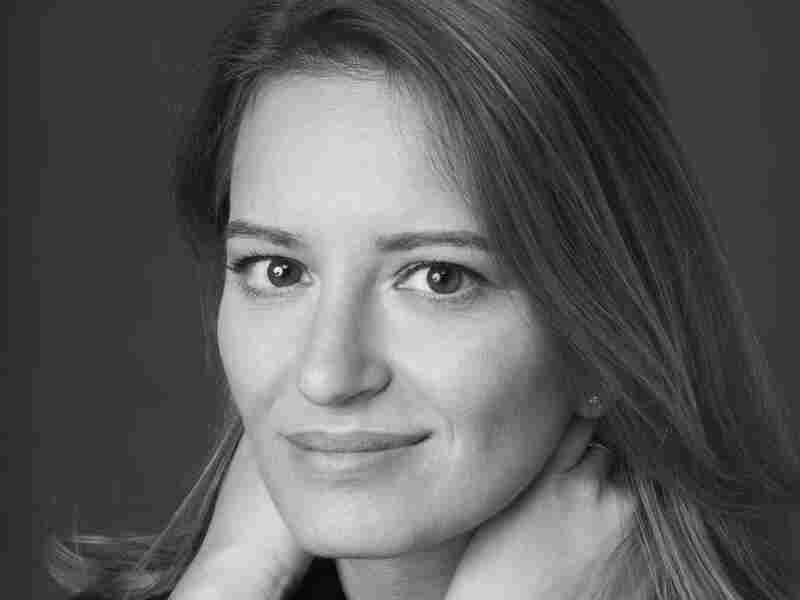 Katy Tur is now an anchor for MSNBC and a reporter for NBC News. I just remember thinking, "smile and wave." Because if you smile at them and you wave, I had learned up to this point, then you diminish the tension, you defuse the situation, you mitigate it. Because if you look intimidated, if you look scared, people will take advantage, and people will push hard. ... I had felt uneasy before then, here and there, but that day I thought, "This is taking it too far." On Donald Trump calling her "Little Katy"
I'm 5'2", 5'3" on a good day. ... Marco Rubio [whom Trump calls "Little Marco"] is quite tall. I am much shorter than Marco Rubio. I think he means it not only in a physically demeaning way, but as an intimidation tactic: You're little, you're young and you're inexperienced and you can be pushed around. You're not a political heavyweight. You're not one of the big guns. I presume that's sort of how he means it, but he's also a very literal guy. When he sees someone who is little, and I am little, I think he is apt to say just that, that person is a little person. I was powerless. I just stood there frozen thinking, "Oh my God, what is this man doing? He's not my friend. He's not my business partner. He's not my social acquaintance. He's not a family member of mine. This is somebody I am covering." This is a presidential candidate; I am the reporter assigned on this beat — it just crosses a huge line. It's so unprofessional and so inappropriate given the circumstances. I remember being horrified that a camera caught it and that my bosses back in New York would see it, and they would think that I was not a serious reporter and that I was too close to the campaign and I couldn't report accurately or fairly about him or that viewers might think that. I panicked. I went and I found one of our senior producers for Morning Joe and I asked, "Did you catch that on camera?" And he said, "No, we didn't." And I remember breathing a sigh of relief and then hearing Donald Trump brag about it on the air with Joe Scarborough and Mika Brzezinski. I knew that he was going to try and intimidate me. I knew he was going to try and steamroll me. And so when he said, "You're stumbling," I remember smiling and laughing a little in my head and saying, "Of course he's doing this." But also saying, "He is trying to intimidate you, so take a deep breath. ..."
[The interview] put me onto the political scene in a significant way. It was a really contentious and tense interview. I didn't realize how angry he was in the moment while I was interviewing him. I presumed it was all a part of his shtick, it was all part of this show that he has. He's a reality TV show host, he's known for the catchphrase, "You're fired." He's known for getting in people's faces, so I just thought this was him being TV's Donald Trump. When I watched it on the air, alongside Chuck Todd [NBC's political director and moderator of Meet the Press] ... I couldn't believe how angry [Trump] actually was. He was seething. He never smiled. He was glaring at me the whole time. It was very clear that he had anticipated a much easier interview. My parents covered police pursuits and it was in many ways the beginnings of reality show TV in this captivating story that was a lot of flash, but not all that much substance. So when they popularized it and made it must-see television in the '90s, you couldn't tear yourself away from a police pursuit; there was cheeky talk, which obviously had a grain of truth to it, that they were responsible for diminishing the seriousness of the nightly broadcast of news. I have mixed feelings about it now, because they covered a lot of really serious stories.